Great Concert. 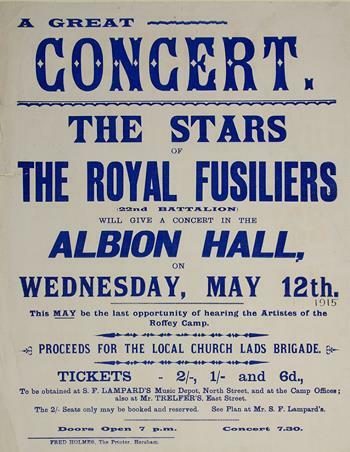 The Stars of The Royal Fusiliers (22nd Battalion) will give a concert in the Albion Hall on Wednesday, May 12th . This May be the last opportunity of hearing the Artistes of the Roffey Camp. Proceeds for the Local Church Lads Brigade. Tickets 2/-,1/- and 6d. To be obtained at S F Lampard’s Music Depot, North Street, and at the Camp Offices; also at Mr Trelfer’s East Street. The 2/- seats only may be booked and reserved. See Plan at Mr S F Lampard’s. Doors Open at 7 pm. Concert 7.30. Fred Holmes, The Printer, Horsham.